In the Middle Ages, the Shrine of Our Lady in Doncaster was one of the country's most important pilgrimage sites. 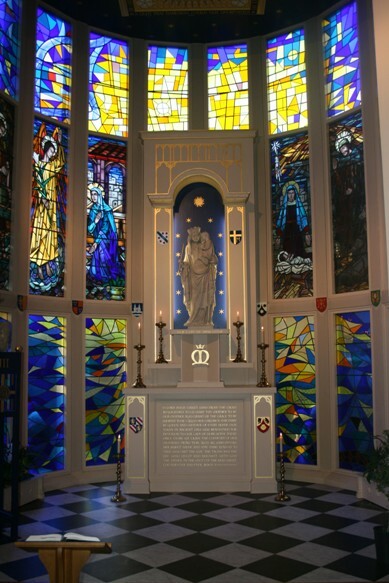 It was located in the priory of the Carmelite Friars, and became specially prominent after the intercession of Our Lady was deemed by the townsfolk to have saved some people from drowning in the River Don. The shrine was hugely popular, one of several around the country, Henry VII had mass before it here on one occasion. "She hath been the Devil's instrument, I fear, to bring many to eternal fire; now she herself with her older sister of Walsingham, her younger sister of Ipswich, and their two sisters of Doncaster and Penrhys will make a jolly muster in Smithfield. They would not be all day in burning". There is no record of what happened to the shrine after this, but it's destruction is certain. The Victorian catholic parishioners in Doncaster revived a devotion to Our Lady of Doncaster. In the twentieth century the shrine was transferred to the parish church of St Peter-in-Chains, and in the early years of the twenty-first century the parish decided to renovate the shrine.